The weather window that wasn’t expected to open stayed open longer than expected allowing me to ride with the Anglesea mob on Saturday morning when I wasn’t expecting to. I only have a mountain bike up-and-running now, and don’t possess rain gear since having it stolen, along with my car, in Shinboner territory – but that’s another, Dickensian, story. To cut this long story short, it was a short ride with Paul, rather than with the main group – a 10k ‘sprint’. But, it’s all about the coffee, that’s why our group is called the Anglesea Coffee and Cycling Club. To Gum Flats Road and back was far enough to stir those taste buds. Three Pauls ride with the ACCC, and when we’re all together it’s often referred to as ‘an appalling’. I’m presently short-staying in Newtown, and liked the idea of being able to stroll to Kardinia Park to watch the footy, so once coffeed and cycled, and back in G. town, I ambled the gently sloping suburban streets (flanked by heritage homes yet to be secunded by developers), along with a gathering gale, down to the ground. It wasn’t with any great enthusiasm about the match, however, given the Cats’ unpredictable form. On the upside, we haven’t been on the receiving end of any thrashings. Our best is good enough, but can we be at our best when it matters etc, etc? Some of our games this year made me sit-up, others had me more inclined to throw-up. Kardinia Park developments, and my current nomadic state, mean I’m not up to scratch on all the changes. It was an unexpected surprise to find general admission seating. It was probably always there, but either full when I looked or I just assumed it was reserved. Today, there was ample space. 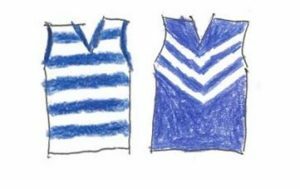 I found myself among Freo fans – not through any planning. The adjacent couple were friendly, but the fan sitting directly behind is what I call a ‘clapper’ – the type who claps, loud and hard, close to your ears every time their team does something remotely well, or your side stuffs-up. Unfortunately, he had a lot to clap about in the first quarter. He was also of the running-commentary variety, complete with Dermot Brereton stereotypes about Joel Selwood. Jokes aside, I appreciated the smattering of purple haze and when opposition fans, generally, make an effort to attend KP. There’s always been more space available than the media has suggested, especially in standing room. And win or lose, there’s the Great Ocean Road to cruise. I’m a positive clapper myself, sometimes, when there’s an obnoxious opposition fan in front. Today, though, I’m particularly quiet due to the previously mentioned lack of expectation. But generally, I don’t attend the footy to barrack against the other team. During our lack-lustre first quarter, a wry thought clouded my mind – Paddy would be tired. After all, he wants a 17-round season and shorter matches. At round 22, he must be buggered. I texted Rob at quarter-time – he had his son and couldn’t make it. I advised surprise about the general admission, and added that if the Cats didn’t lift there’d be even more spare seats by half time. Fortunately, if you don’t like the way the Moggies are messing about, hang around ten minutes – or, in this scenario, until the second quarter when we played with verve and brilliance. The weather, meanwhile, did what was originally expected and dark clouds threatened above the Premiership Stand. I overheard the Freo Clapper reckoning it would miss us. I looked overhead, noted the direction the wind blew scouting vapours, and left him to balmier predictions. I watched the last few minutes in the bar. By now hail was falling. The tempest was fairly brief, though, and added excitement. A rainbow arced the horizon and heralded its end. Ten goals by us made for a stunning stanza. I spent the second half standing in the Post Gary Ablett Syndrome Terrace among Geelong fans of wit and repartee, who used such terms as ‘execrable’, while we piled on 23 unanswered. For Pussie faithful the footy was enthralling and much better than …anticipated. And news was delivered – the Pies beat Port, simplifying finals permutations. I momentarily spared a thought for the Freo Clapper with frozen hands, sitting on a wet seat, but he and his mates had probably found the bar by then. Fyfe gave him something to clap about – sometimes you have to see a player live to appreciate how good they are – Fyfe seemed to win every contest with uncanny ease. For us, Jack H. is compared to H. Taylor. I hope to see him in the mould of a Royce H. Tim Kelly has everything except a left boot, but even Ned had a chink in his armour. Thurlow was stiff to be dropped following the Tigers loss – he was good today and hitting targets. Perhaps, soon, everyone’ll be talkin’ about Jackson? I’m sure corny humour was expected. Overall, it was a timely team effort, though the degree it reflected Freo’s lack of opposition is hard to judge. In the Footy Cats box of chocolates you never know what you’re going to get. That hasn’t stopped me opening the lid yet, though. If we make finals, ultimate success would require us to be at our best four weeks in succession. Considering recent years, that would be unexpected. But as they (almost) say in financial circles: past (mediocre) success – or failure – is not necessarily an indicator of future performance. Anything is possible. A-Buying a Geelong beanie because it was that cold. B-Arguing about Ross Lyon complete with sarcastic comments. C-Embraced the warm embrace of football death through wine and knowing this all happened before except never with hail. You are right, the day did go a lot better than anticipated. the weather almost appeared purpose-built to greet Fremantle – not to mention reinforce climate stereotypes. I was driven to buy a beanie myself. Having shivered through the mid-match hailstorm myself, I can only hope Tim Kelly didn’t watch the Weevils v Dees match on the box the next day. 24 degrees and sunny! Yes, belly – perhaps they’ll have to promote the positives of climate change – potentially hastened by the goings on in Canberra and elsewhere.